Elite travel luggage exists. Don’t settle for less. As some airlines ban smart luggage, Away is here to provide useful smart luggage that you can still bring on the plane. The Away carry-on is the ideal piece of luggage for millennials or anyone who loves to stay plugged in on the go. Did I mention it’s also guaranteed for life? If any part ever breaks, Away will repair it or replace it for free! The battery built into the suitcase has 10,000 mAh and allows travelers to charge their electronics no matter their location. 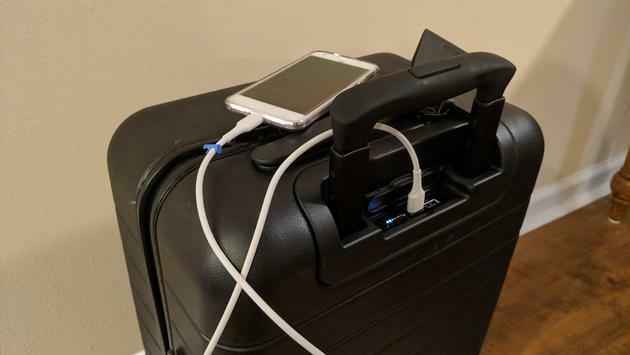 This means no more sitting on the floor at an airport next to a wall outlet just to get some extra battery life for your phone, tablet or computer before boarding the plane. Plus, the battery pack is incredibly easy to remove. It’s a simple as pushing a button. Once it pops out, you can then use it on the plane to continue charging your electronics and any USB device. Remove it from the luggage if you end up checking the bag, though. Otherwise, keep it in place for your carry-on or take it out and use it as your charger in your seat. Again, this amazing high-tech carry-on is safe for flying! It’s TSA-approved and compliant with all airline policies. “At Away, we say that we make 'thoughtful' luggage rather than 'smart' luggage because we’ve always designed our bags with the actual needs of travelers in mind. The main carry-on is 21.7” x 13.7” x 9” and weighs seven pounds. Away does offer a bigger one if you feel like you need more space. Inside the suitcase, you’ll find 38-liter capacity, so there is plenty of space for all your belongings. There’s enough area on both sides to pack a variety of clothes as well as shoes and toiletries. Upon opening it, remove the instructional notebook and charger. You’ll need the book to help you reset your lock combination as well as guide you through other features and notes about the suitcase. You’ll want the battery out so you can go ahead and start charging it before you travel. 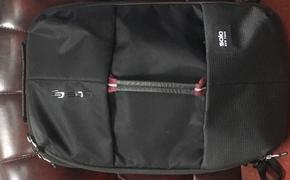 The built-in compression pad is nice for storing smaller items, and the fact this suitcase includes a nylon laundry bag that you can use to separate dirty clothes from clean clothes is brilliant. It’s water resistant too, so feel free to go for one final swim in on your last travel day then just toss the wet bathing suit in the laundry bag and you’re good to go. How great is that? Overall this carry-on luggage is thoroughly and thoughtfully designed to meet all your needs when flying. Technology plays a major role when traveling, as does safety. Away delivers a top-notch product in both of these areas, making your life easier when on the go. It currently sells for $225, which is lower than some high-end luggage out there. Given the easily removable battery that you can take anywhere and how practical the inside is, why would you go with anything else? NOTE: Away provided a free sample in preparation for this article.